Just a short distance northwest from the African coast are the Canary Islands: a collection of sun-kissed volcanic islands in the shimmering North Atlantic Ocean. The largest of the Canary Islands, Tenerife offers a mixture of golden and black-sand beaches, revelry and spectacular scenery, and it couldn’t be easier to get around Tenerife’s roads and discover it for yourself. Alongside its beautiful beaches, luscious green forests surrounding a volcanic natural wonder, and a vibrant capital fringed by a peppering of quaint Canarian villages, Tenerife is brimming with interesting architecture. 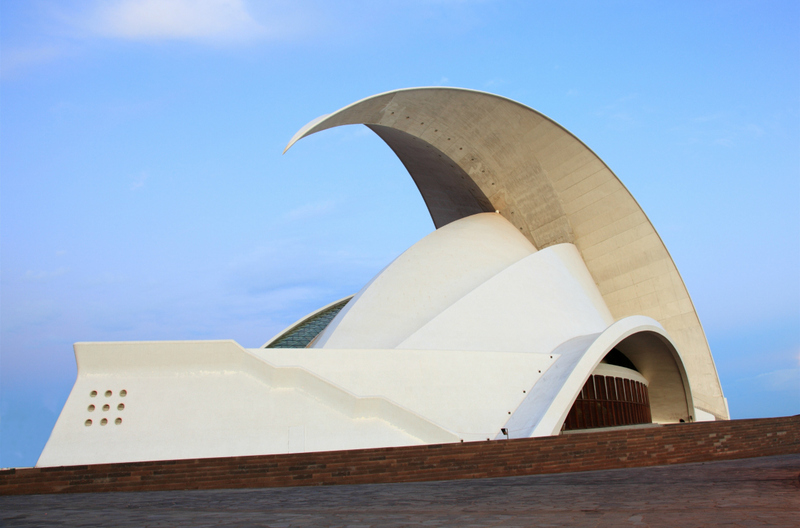 Fans of modern architecture will love the auditorio de Tenerife. The structure features a striking wave shape set against the backdrop of the brilliant blue sea, strongly reminiscent of Sydney’s waterfront. Make a visit to the Basilica of Candelaria in the south of the island to see design influenced by the Spanish colonial period. This age of history saw the arrival of European Gothic and Neoclassical architecture in Tenerife, and it still holds services today. The Cathedral of San Cristóbal in La Laguna is every bit as a charming – the UNESCO site is perfect for some quiet contemplation. Just five minutes’ walk around the corner is Taberna Ossuna, an authentic Canarian restaurant perfect for a leisurely post-learning lunch. But what is there to do in Tenerife if you prefer more energetic pursuits, or are holidaying with children that need entertainment on a larger scale? A Tenerife water park should definitely be on your to-do list. Siam Park was voted TripAdvisor’s favourite waterpark in 2015, and has been thoughtfully designed to cater for adrenaline junkies as well as those who simply prefer to sunbathe. Recline in the secluded areas on sunbeds beside the lazy pool, or take on ‘The Dragon’ or the ‘Tower of Power’ (passing through a huge aquarium full of sharks and rays) if you’re something of a thrill seeker. The Wave Palace and ‘El Gigante’ are both suitable for all the family, so pack your swimming costumes and spend a day tearing around this exciting water park. 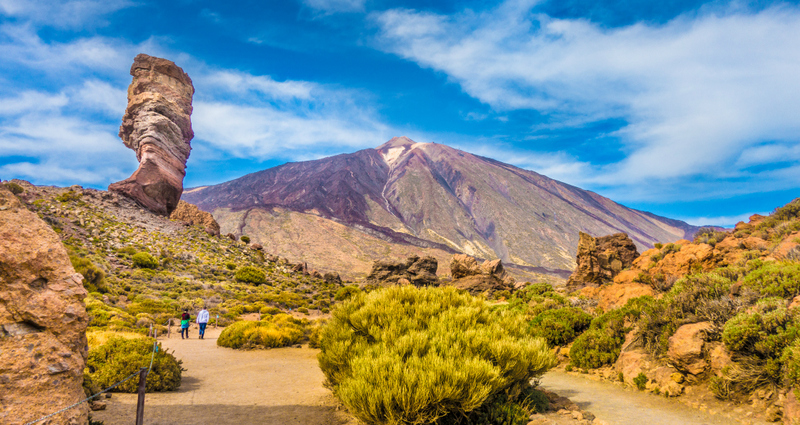 Teide National Park provides some awe-inspiring moments all their own. The scenery surrounding Spain’s highest peak is spectacular, with ancient lava flows baked under the sun and a night sky so clear that you can often see the Milky Way at night. Whatever time of year you visit, the view of the Mars-like landscape from the cable car will stay with you forever. Sit tight as you’re elevated to more than 11,500ft in a little over eight minutes, and if you secure a permit to hike the last bit, you’ll reach the top of the peak where you can see Tenerife sprawling out below. If you’d like to try something sporty, Golf La Rosaleda is a serene short course that’s just a five-minute drive from Puerto de la Cruz. The resort offers a golf school for beginners and experienced golfers alike, so you can work on your game no matter what skill level you are. Fifteen minutes west of the course you’ll find Loro Parque, a zoo that’s home to tigers, penguins, gorillas and other fascinating animals. Not only is it a brilliant day out, but it’s also a good opportunity to learn more about wildlife conservation and care of endangered species, so hire a car to get there easily. As well as all these exciting things to do in Tenerife, there are plenty of day trips to book, including Tenerife tours of the island and tours of nearby places. Step aboard the ferry in the south of the island beneath the dazzling sunshine, taking the short journey to the small but perfectly formed island of La Gomera. Official tours will take you through the green and luscious Garajonay National Park before enjoying an authentic Canarian lunch in Las Rosas or Agulo. Alternatively, you can spend a day in Tenerife’s caves, journeying ever deeper into the Cueva del Viento. These lava tubes were carved out nearly 30,000 years ago and can now be explored on guided tours leaving Icod de los Vinos. Down in the caves, walk on lava rocks and explore the labyrinth of caves deep beneath the island’s surface: it’s a side to the island few people get to see, and will give you a much deeper appreciation for Tenerife. Both these tours (and all the day trips and activities above) are easily accessible if you have a car, so consider hiring a car from Tenerife’s southern airport and using it to get around while you’re on holiday. With all this exploring, you’ll need somewhere relaxing, comfortable and affordable to stay. The best place to stay in Tenerife depends on your requirements, with the most popular resorts in Tenerife including Los Cristianos (always popular with families), Playa de las Americas (excellent for Tenerife nightlife), and Costa Adeje for four- and five-star resorts. Typically, most of the sandy beach resorts are in the south of Tenerife, with wild nature and scenery in the north. But, don’t overlook Puerto de la Cruz in the north: it’s wonderful for families and is a little quieter than the resorts in the south. If you’re treating yourself to a luxury stay, book a room at the Gran Hotel Bahía Del Duque Resort in Costa Adeje: you’ll enjoy canopied beds with crisp white bedding, a luxurious spa and excellent restaurants and cocktail bars. For something rather cheaper in the north of the island (but spotlessly clean and well-reviewed), try Luz Del Mar in the centre of Puertito de los Silos. It offers a spa and gym for guests to use, and it’s just a five-minute walk to a rocky beach and numerous hiking locations. But what about the best restaurants in Tenerife? In addition to numerous authentic taverns and restaurants, Tenerife boasts some world-class dining to enjoy if you’d like a memorable meal. Try Kabuki – this Michelin-starred restaurant is open to non-guests of the Ritz-Carlton Amaba Hotel, serving Japanese fusion cuisine among elegant, minimalistic décor. El Rincón de Juan Carlos is well worth a reservation too: this Michelin-starred restaurant serves from a selection of extensive tasting menus to delight your taste buds. For something more relaxed and informal, visit El Cine – a fuss-free restaurant with plastic tables and chairs specialising in excellent fish and chicken. Expect to queue for a seat but know it’s well worth the wait. And for something memorable enough to linger long after your holiday is over, try La Cueva Caprichosa – this restaurant is set inside a cave and feels particularly romantic with its exposed stone and flickering candlelight. Of course, no travel guide to Tenerife would be complete without mentioning its beaches. You’ll be surprised by the diversity of this island’s coastline with its famous black-lava beaches, long stretches of golden sand, rocky shores, and even the odd patch of greenery bordering the sea. There are beaches that are perfectly suited for sunbathing and sandcastle building, as well as those that are ideal for water sports and swimming - so it’s simply a matter of choosing the ones that take your fancy. If you’ve hired a car, you’ll easily reach Playa El Bollullo. This beach is well off the tourist track and offers just one small bar for refreshments – perfect if you want to spend a day sunbathing in peace. The waves are strong and only for confident surfers, and the car parking is cheap too. Or, lay down your beach towel on Playa Las Teresitas – the long stretch of soft golden sand shipped in from the Sahara makes it popular with those looking for an alternative to Tenerife’s natural black sand beaches. The water is warm and shallow, ideal if you’re holidaying with small children. If it’s water sports you’re after, make your way to Fañabé beach. It offers easy access for swimmers, and the summer sees the stretch of water filled with jet skis, water parachutes and banana boats. There are toilets and showers on the beach, and numerous restaurants and boutiques to explore nearby too. But if you’re looking for the chance to try some kitesurfing or windsurfing, visit El Medano beach instead: this windy beach offers a laidback atmosphere and a sunset walk along this stretch of sand is particularly romantic. Finally, Tenerife’s volcanic landscape makes it a wonderful destination for a spot of hiking. Whether you want to immerse yourself in the island’s dense greenery and listen for the calls of exotic birds and other animals, or you fancy trekking in the Anaga Mountains, there are numerous walking routes to suit all abilities. Mount Teide offers more than 30 hiking tails of various difficulties and experience levels, and you should expect to take at least six hours to approach the volcanic peak. If you’d prefer to enjoy a hike that’s a little less strenuous, the rainforests near the Anaga Mountains are worth exploring. Walk for four hours between Igueste de San Andrés to Chamorga among the dense emerald greenery, and marvel at the steam rising from the trees like a misty, exotic fog as the sun begins to warm the moisture away. As you can see, Tenerife remains the classic getaway for those wanting to spend time in the sun. 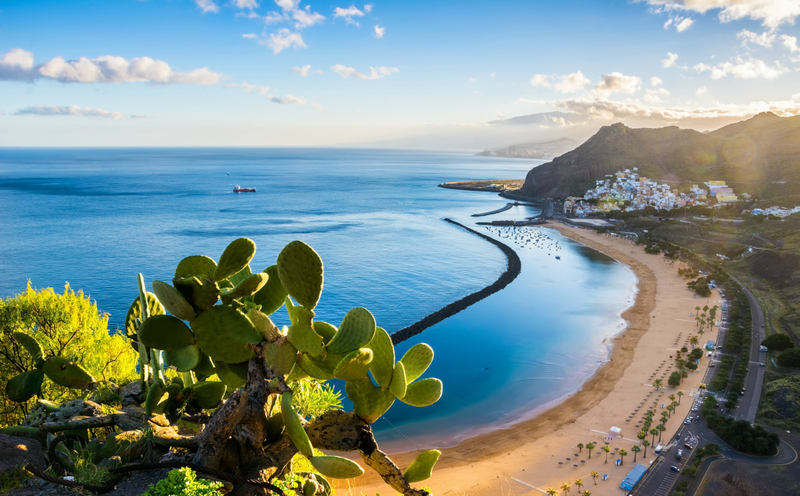 Make the most of the beautiful beaches while also enjoying some great architecture and history, and Tenerife’s dining and entertainment options too. And don’t forget to set aside a little time to soak up Tenerife’s incredible natural scenery: where else can you enjoy rainforests, caves, lava flows and volcanoes so close to home?